Oxides and sulphides and other opaque minerals are found in all basic and ultrabasic rocks. They vary in amount from minor accessory phases to massive ores, The identification of opaque phases within these rocks is important, for potentially they can provide information regarding pressure, temperature and fo2 and fs2, conditions during their formation. The opaque minerals also control the geomagnetic properties of these rocks. These extraterrestrial rocks comprise silicates (olivine, pyroxenes, plagioclase) with iron-nickel alloys, metal oxides and sulphides. There are four classes of meteorite which, in decreasing abundance of opaque minerals, are irons, stony irons, chondrites and achondrites. The opaque mineralogy varies between the classes, but all the assemblages are distinctly different from terrestrial rocks. The main minerals are kamacite (alpha-Fe), taenite (gamma-Fe), troilite, chromite and spinel. Associated minor minerals include schreibersice, magnetite, ilmenite, daubreelite, graphite, oldhamite, cohenite, niningerite, alabandite, pentlandite, mackinawite, sphalerite, chalcopyrite and native copper. Many of these primary minerals rapidly oxidize to limonite under terrestrial conditions. 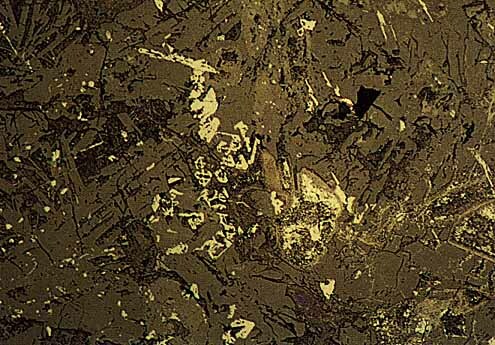 Modal analyses of fine-grained basalts or highly altered basalts can be difficult to obtain using normal thin sections and transmitted light petrography. Accurate modal analyses are easier to achieve using a well polished thin section. The main primary opaques of basic rocks (gabbro, dolerite and basalt) are chrome spinels, magnetite-ulvöspinel (titanomagnetite) and ilmenite-haematite solid solution minerals, rutile and the sulphide breakdown products of the monosulphide solid solution in the Fe-Ni-S system (mss), or intermediate solid solution in the Cu-Fe-S system (iss). These sulphides include pentlandite, pyrrhotite, pyrite, chalcopyrite, cubanite and mackinawite. Texturally, early spinels form small euhedral crystals within olivine and pyroxene and sulphides occur as small droplets within, or about, silicates. Magnetite-ulvöspinel forms euhedral equant crystals with curved fractures; they are often zoned and in fine-grained lavas characteristically are skeletal and cruciform in shape. Ilmenite forms laths or lobate lath-shaped crystals, or symplectite-like intergrowths with silicates. In altered basic rocks, oxidation, oxidation-exsolution and autometasomatism (including the introduction of secondary sulphides) are the processes that often dominate the opaque mineralogy. 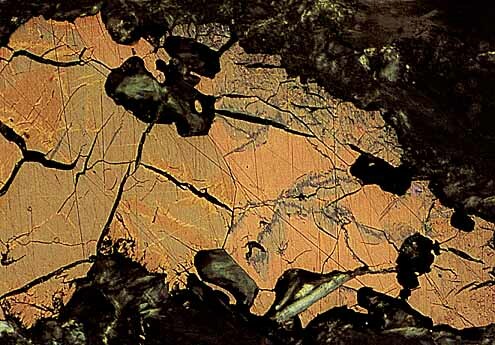 Primary oxides undergo complex mineralogical changes on oxidation which partially depend on pressure and temperature. The alteration is initiated along grain boundaries and fractures and results in a number of different secondary minerals which have similar optical properties and are often intergrown on a fine scale. These minerals are most accurately identified by microanalysis. The initial oxidation products of magnetite-ulvöspinel solid solution (titanomagnetite) include titanomaghaemite, ilmenite and haematite. Characteristically, ilmenite forms fine trellis-like 'exsolution' lamellae oriented along (111) of the host magnetite and these coarsen with increasing oxidation. On yet further oxidation, the lamellae are pseudomorphed by fine-grained mixtures of rutile, titanohaematite and pseudobrookite. With extreme oxidation, the end product is a mixture of haematite with minor pleonaste after magnetite, and rutile after ilmenite. Alteration of ilmenite produces complex intergrowths of ferrian ilmenite, ferrian rutile, rutile, titanohaematite and pseudobrookite. Extreme alteration results in mixtures of haematite and TiO2, minerals that pseudomorph the original grain. Chromium spinels oxidize to lighter coloured 'ferritchromits'. Weathering alters iron oxides to haematite, and both oxides and sulphides to limonite (a mixture of goethite and lepidocrocite). Secondary copper sulphides replace earlier copper minerals. Magmatic oxide ores fall into a number of classes and associations. (a)	Magmatic segregations of chromite, magnetite, and ilmenite associated with layered basic intrusions. The oxides display little chemical variation. (b)	Chromite with magnetite and very minor ilmenite within podiform deposits. The spinels show a wide variation in their Al2O3:Cr2O3 ratios. (c)	Magmatic segregations of ilmenite-haematite and ulvöspinel-magnetite minerals associated with anorthosites. (d)	Magnetite and haematite ores associated with apatite. (b) Podiform deposits, often called Alpine-type. Stratiform deposits These deposits are few in number but large in size and are associated with Archaean to Proterozoic in age layered basic intrusions within Precambrian cratonic areas. Within the intrusions, an upper mafic zone overlies a lower ultramafic zone of dunites, pyroxenites and peridotites that carry chromitite layers. These layers are up to 1m thick, laterally extensive, and comprise euhedral cumulate chromite with interstitial olivine, ortho- and clinopyroxenes and plagioclase. Chromite, as euhedral grains within the silicate matrix, is the main oxide, accompanied by magnetite, ilmenite, pyrrhotite, pentlandite and chalcopyrite. Platinum group minerals occur in trace amounts often associated with iron, iron-nickel, copper and copper-iron sulphides. Platinum and palladium are the most abundant platinum group metals in these ores. The Bushveld Complex (extending for 180 000 km2) is a series of overlapping funnel shaped intrusions oriented along ENE and WNW structural trends and is the result of long-lived magmatism involving a number of different magmas. It consists of the Laminated Marginal Sequence, the main Layered Series and the overlying Bushveld Granite. The Layered Series has five zones, including the economically important Critical Zone which is divided into an upper anorthosite subzone and lower pyroxenitic one. Chromitite layers occur in both subzones but are mined mainly from the lower pyroxenite subzone. The layers have a simple mineralogy, essentially chromite with interstitial bronzite and plagioclase, and very minor amounts of sulphides. The Great Dyke is over 530 km in length and up to 9 km wide. It comprises four layered ultramafic and mafic (gabbro) sequences. Stratiform chromite layers occur within the lower dunite, harzburgite, pyroxenite and serpentinite units. A nickel, copper and platinum group metal-bearing horizon occurs within ultramafic rocks just below their contact with the gabbros. Shetland Islands: A dismembered Caledonian ophiolitic sequence is emplaced in Moinian/Dalradian rocks. The ophiolite comprises serpentinized harzburgite overlain by a layered ultramafic sequence and gabbros. Harzburgite has thin dunite lenses; these lenses carry discontinuous chromite layers and pods. Primary ilmenite deposits are uncommon. The orebodies occur as magmatic segregations in the form of lenses, dykes or sills within gabbro-norite-anorthosite sequences or within anorthosites. Magnetite and iron, nickel and copper sulphides occur in minor amounts in the ores. (Lister, 1966; Philpotts, 1967). 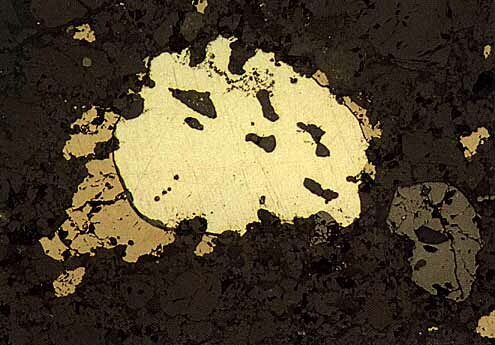 Small magnetite deposits are common within gabbroic bodies. Magnetite in the large magnetite layers within the Upper Zone of the Bushveld is vanadium-rich and is exploited for vanadium in addition to iron. These deposits are important sources of nickel and copper, together with by-product platinum group metals, gold and iron (from pyrrhotite). Nickel sulphide deposits fall into two main associations, both of which have a number of subclasses. 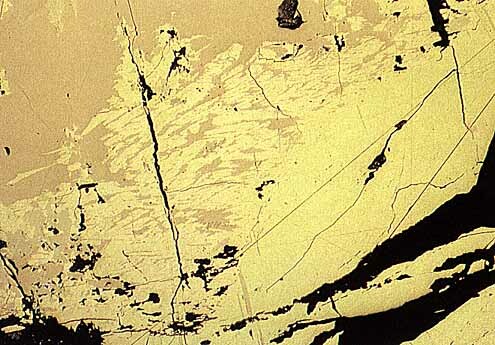 These are: (a) a dunite-peridotite association with two subclasses, the volcanic peridotite subclass and intrusive dunite subclass; (b) a gabbroic association including mafic and ultramafic complexes, layered basic intrusions and the unique Sudbury Complex (Naldrett and Cabri, 1976; Naldrett, 1981; Arndt and Nisbet (eds. ), 1982). Deposits of this association are found within Archaean greenstone belts. The Sudbury Igneous Complex contains sulphide deposits which are mined for nickel, copper, cobalt, iron and platinum group metals. The complex is believed to be unique, as it is interpreted as being the result of a meteorite impact. The Complex is an irregular-shaped lopolith 60 x 30 km in size and 4 km thick and consists of a lower (outer) norite overlain by gabbro and with an upper (inner) granophyre capping. The complex is overlain by the Onaping Formation of volcaniclastic rocks and sediments. Within the mafic and ultramafic complex, sulphide mineralization is found close to the lower contact, within a suite of sulphide-rich norites and gabbros, known as the Sublayer and also in a series of steeply inclined dyke-like quartz diorite ,offsets'. Sulphides have segregated out from the Sublayer onto the undulating footwall of the complex to give massive sulphide ores, above which are disseminated sulphides. Disseminated sulphides also occur in the hangingwall quartz norite. The quartz diorite offsets have massive sulphides ores and disseminated sulphide-rich rocks. The ores comprise hexagonal and monoclinic pyrrhotite, pentlandite, chalcopyrite, pyrite and magnetite together with ilmenite, cubanite, cobaltite, niccolite and gersdorffite. Platinum groups minerals occur in trace amounts and include sperrylite, michenerite, moncheite, merenskyite, mertieite II and froodite. (Hawley, 1962; Hawley and Stanton, 1962; Souch et al., 1969; Gasparrini and Naldrett 1972; Cabri and Laflamme, 1976).